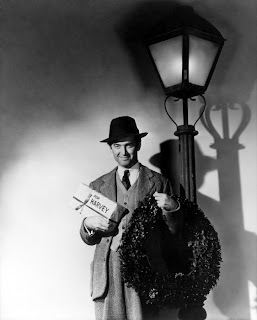 James Stewart stars as Elwood P. Dowd, an affable alky with an unusual friend named Harvey, in this adaptation of the Pulitzer Prize-winning play. Harvey is a six-foot, three-inch tall rabbit that can only be seen and heard by Elwood. Well, actually, Harvey isn’t a rabbit at all. He’s either a figment of Elwood’s inebriated imagination or a pooka--a fairy spirit in animal form. Of course, Elwood’s unseen pal is a constant source of embarrassment for his live-in relatives, who find there may be more to Harvey than meets the eye when they try to have Elwood committed. Unlike many stories transported from stage to screen, Harvey never feels stagy. Stewart, revisiting the part he played on the stage, gives one of his very best performances. Two other holdovers from the theater version, Josephine Hull (who bagged the Best Supporting Actress Oscar) and Jesse White, provide dynamic support. 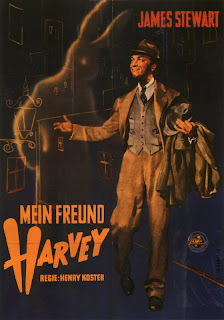 Much like the genial tippler at the center of the story, Harvey is an exceedingly pleasant and charming film without much of an edge. Although Elwood’s drinking is discussed ad nauseam, the boozing is not explicitly displayed on screen. All we really see is Elwood order multiple martinis, while other barflies sip beer in the background. 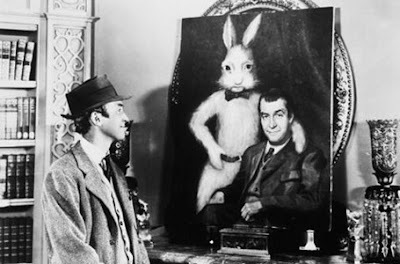 Based on the fact that Elwood’s tippling is spoken of in the same manner as discussions of his bunny buddy, I assume Harvey is meant as a metaphor for the shame some feel in dealing with a drunkard. However, the film also works if viewed on a pure fantasy basis. Consequently, Harvey is a rare movie with adult themes that is appropriate for the entire family. 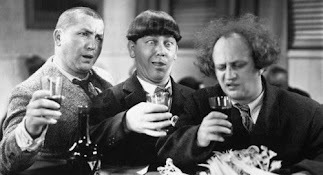 Potent Quotables--DR. SANDERSON: Oh, I suppose you take a drink now and then like the rest of us. ELWOOD: Mmmmmm… Yes. Yes I do, doctor. As a matter of fact, I’d like one right now. Similarly Sauced Cinema--If you want to see Jimmy Stewart put away booze, I’d recommend The Philadelphia Story (1940). However, if oversized bunnies are more your bag, you might want to check out Night of the Lepus (1972) or Donnie Darko (2001). Night of the Lepus mentioned in the same article with the film Harvey...brilliant Garv. Why did it take so long for humans to see the connection? All praise for the mention here, but never forget that Night of the Lepus is a far better film. By the way, if you're taking a poll on what Harvey is - I vote pooka. Ah, this was my favorite movie as a young' un. I never picked up on the booze aspect of it then, for some reason. I didn't notice the drinking in HARVEY either as a kid, which is strange, because I was a huge W.C. Fields fan from age 5. I really wasn't sure if the film would qualify for "Booze Movie" status until I watched it again recently. Seeing the familiar story with new eyes, the alky content is pretty blatant in the dialogue if not on screen. I have to say, I enjoyed the film even more watching it now than I did when I just thought it was about the invisible bunny.